Introductory Experiments on Biomolecules and their Interactions provides a novel approach to teaching biomolecules in the lab. While featuring the requisite fundamentals, it also captures the author’s experience in industry, thus providing unique, up-to-date experiments which take the learning experience one-step further. The text parallels lectures using a standard biochemistry undergraduate text. Unlike most current lab manuals available in the market which simply emphasize an introduction of techniques, this lab manual provides students with opportunities to demonstrate and prove the knowledge and theories they learn from class. Dr. Qiongqiong Zhou is an assistant professor at Missouri State University, where she studies cytoskeleton dynamics in her lab and teaches several core courses related to biomedical sciences. Prior to that, she was a research fellow in Douglas Robinson’s lab at Johns Hopkins University and Ulrike Eggert’s lab at Harvard Medical School. Dr. Zhou graduated with a major of life sciences in 2002 from Fudan University in Shanghai, China. Then, she earned her Doctoral degree from University of Southern California, where she studies neurodegerative diseases with Dr. Enrique Cadenas. 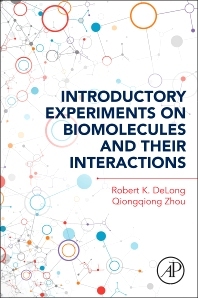 With a passion for undergraduate education, Dr. Zhou has led the lab of Biomolecular Interactions for more than 6 semesters using and continuously improving this lab manual. She has the most direct laboratory experience of these experiments with students.